This week was a 4 person yellow ball challenge. 7 teams took part and it was no surprise that some of the old hands took the honours. The weather was excellent and the greenkeepers have spent all week repairing and seeding the rough areas. The greens are still very fast. We were informed yesterday that annual membership is no longer available on all Olagolf courses. This is very strange as many players have taken advantage of the membership offer since xmas. At 1080e (single) and 1350e (family) it was a really good deal. It seems that Olagolf now wish golfers to take up 10 or 15 year membership instead. As I get more details I will post them on the website. Very strange as in the current economic climate people just don’t have that kind of money. Also after the near collapse of Polaris World last year who knows what will happen next? It seems very short sighted. When current membership deals run out players are going to look around other courses for the best deals even though we have the best course in the area on our doorstep. The members play our own course rather than pay to play other courses, so it is likely Olagolf will lose that loyalty. If it is better for our members the Society will look at other venues. Remember from March 1st any golfer wishing to play at society times and benefit from our reduced rates will need to become a member. This is an annual payment of 5 euros, but our rate is 10 euros below the residents rate. The money raised will pay for admin costs and the rest will be for the benefit of the members (trophies etc.). Next week is an individual stableford and times booked will be from 09.00 to 10.30. 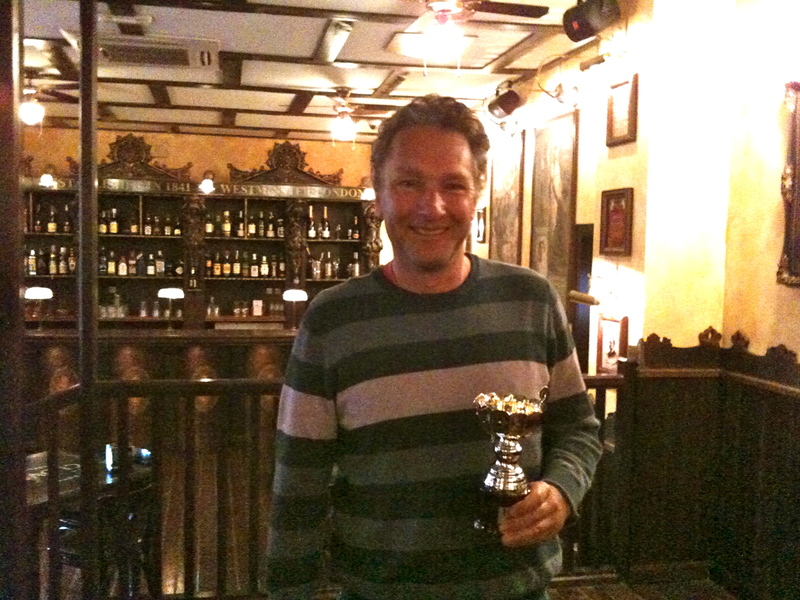 Dave Lloyd (one of the founders) has agreed to take up the position of competitions secretary. When he is not at Condado Graham White will fill in for him. 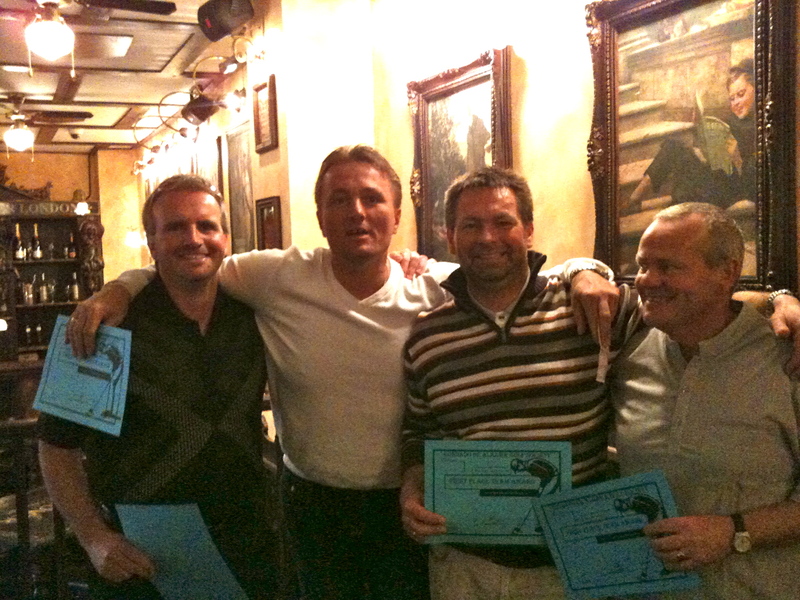 Last night was another society event at Scot’tees for fish and chip night and a quiz (won by the locals as usual). Cath is looking at different types of nights out for us. Some of the Hi5 tour players playing this week at Saurines made themselves available to about 20 three person teams. My team of Gert Willumsen and Tim Beisegel were teamed with 21 year old amateur Graham Roberts from Chester. He plays off plus 2.5 and is touring various pro tours getting experience before turning pro hopefully at the end of this year. He is a great prospect and showed his ability especially on the 1st 9. On the 443 yard 5th hole (stroke index 2) he holed his 2nd shot. A couple of birdies followed, but the pinnacle came on the 550 yard par 5 8th hole. He found the left waste area from the tee and then hit a blind shot over the hill. He knew straight away it was good – when we got nearer the green we spotted his ball hanging over the hole. If we could have waited for the wind which got up half an hour later it would surely have dropped in for an albatross 2! A steady 2nd 9 saw him come in a few under par. He was very helpful passing on tips and chatting to us all the way round. It was a pleasure to play with such a nice unaffected young man. It was nice to sit outside the small temporary bar in the sunshine – even such a small bar would be welcome at Condado after a long round. The runners up were from our society, so well done. There were another 4 condado teams taking part. Another good turn out on Monday for the society. 18 players played in the 3 person team event. With 43 on Friday that is a great total of over 60 players in 4 days. 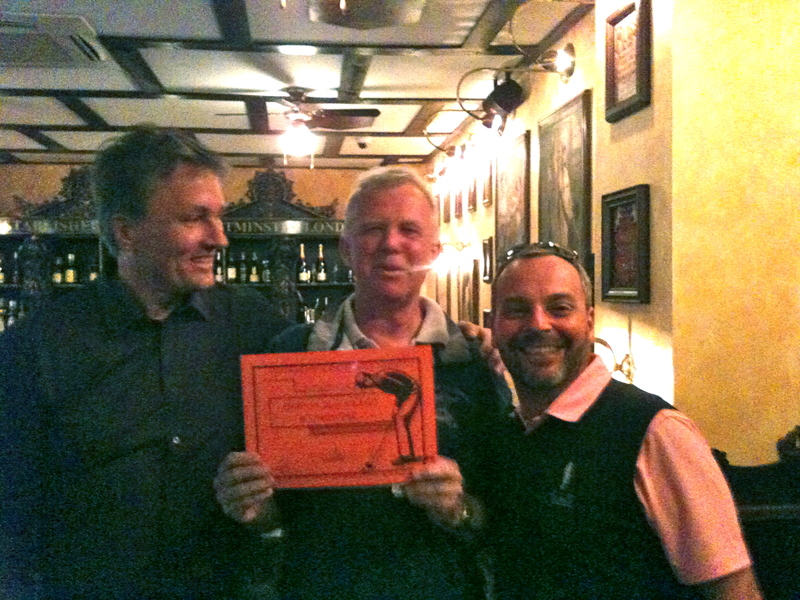 The individual stableford attracted a great entry of 43 players. Olagolf had a good day with a visiting party of 28 following us, and another 16 setting off early. The frosts seem to be a thing of the past so we got away to a prompt start at 10.00. Many players wore shorts as the sun shone and the temperature reached a very nice 20 degrees. The fast greens and the fact that the later starters suffered from wind kept scoring down with only two playing to their handicap. Gert Willumsen (above) nearly holed his tee shot on the 17th – just a couple of rolls short of dropping. I was on the 3rd hole before I realised I still had my trainers on and my golf shoes were still in the hall! So much to do I was bound to forget something! The bar was very busy for the presentation which was good to see. Phil took photos of the divisional winners. The greenstaff were out in force concentrating on the rough areas. There were about 10 of them on the 10th turning over the bare areas, scattering soil and eventually seeding and watering. It did rain early this week which will help the grass grow. Some news on the closure of the course for maintenance. It will be closed for 6 days from May 23nd to May 28th and again September 12th to 17th for hollow tining of the fairways and greens. We expect all players to get a reduction in fees following this work until the condition of the course improves. Next week we start at 10.00 but from March until the end of April our times will go back to 09.00 to 10.30 now the threat of frost has passed. I have booked reserved times form May until the end of September from 08.30 to 10.00 as the weather warms up. Sunday brings the Hi5 protour proam event at Saurines which I will report on during the week. Don’t forget to order your Condado society golf shirt from Phil Marlow at golfsales@pgmpromo.co.uk or ring him on 01274633978. He has kindly offered to donate a percentage of all sales to the society. On the social scene Cath has a few things in the pipeline. Friday 25th February – fish & chip night at Scot’tees with quiz and music. Transport if required by David Ingham leaving Al Kazar 18.45 and 19.15. Meal only is 9 euros or 14 euros with transport. Sunday March 6th – Aguilas carnival parade – transport and reserved seat at the carnival 26 euros per person. (more information to follow). Also we would like to organise a book and information exchange and wish to know if this is of interest. It will be held on the 1st friday of each month at 4pm in the Clover bar.If you are interested contact Cath. This week was a 4 person team event with 2 scores to count on the 1st 6 holes, 3 on the next 6 and all players counting on the last 6. Of the 32 players some teams found the finish very difficult where there was nowhere to hide! Also the greens were fast again with very difficult pin positions. David Wareing managed to 6 putt the 15th which is perhaps the flattest green on the course and won a booby prize from the captain. His partner Ian Field also had a bad day running out of balls at one point before finding some replacements in the water, rough, partners bag etc. He was in so many bunkers he could be nicknamed ‘the meerkat’ as his head was often seen peering over the top on most holes! Needless to say they weren’t among the main prizes! Dave Lloyd was in the prizes (again) with 102 points just pipping 3 other teams by one shot for 2nd place with help from his team of wife Kim, Ernie Pendlebury and Kjell Mundheim. But it was no surprise that the hot favourites (Chris King, Gert Willumsen, Jostein Landsvik and Kevin Smith) ran away with it with a score of 111 points. It didn’t look a good enough score on a calm day but as already stated the Jack Nicklaus course has its own built in defences with pin position placements. There was a special award after the presentation. 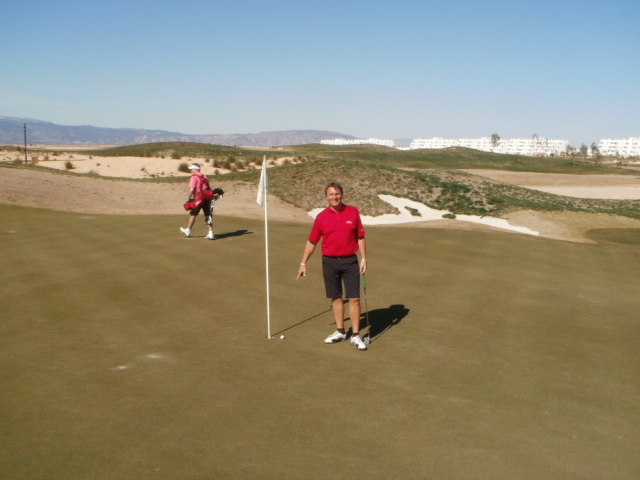 On the 26th November 2010, George Hoskins holed his tee shot at the 204 yard 7th hole. Not a fluke. and the captain saw it head for the hole and disappear. In recognition of his achievement the society purchased George an engraved cup which came as a complete surprise to him. We have had to wait 3 months for his return to give him his well earned trophy. George "in the hole" Hoskins. This is one of the reasons that we will charge for membership. Anyone who gets a hole in one will get a momento and if we have money in the bank we can do this. Next week we are back to an individual stableford event which has a good entry with 28 names down already. Another interesting competition will take place at Saurines de la Torre on Sunday 25th February. The Hi5 professional tour are competing there that week and there will be a pro-am that day with a team of 3 amateurs joining one of the professionals. The prices are really attractive – 15 euros for any Olagolf member and only 40 euros for all others. 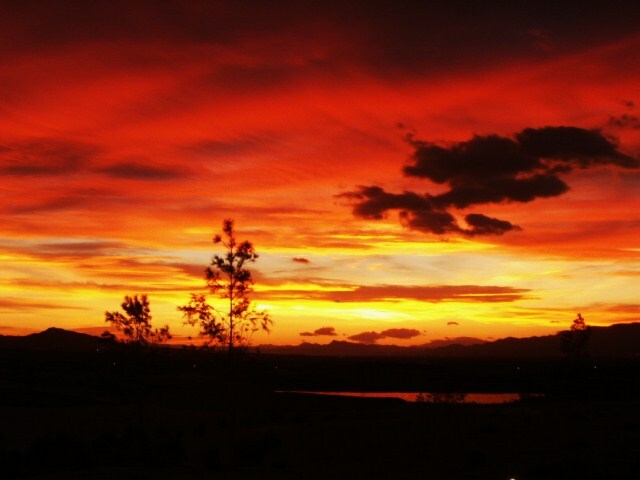 (The residents rate at Condado and other Olagolf courses is 50 euros). There are lots of entries already so the event will be well supported. I will give a report of the day ASAP. Tonight we are having a valentines’ day party at Camposol golf club where the Everley brothers will entertain us. A crowd of 30 are taking advantage of the cheap price of 5 euros entry and 5 euros return transport with David Ingham. Cath will be looking at other venues also for the coming months, so we now have a social scene where anyone from Condado can join us. If only we had our own clubhouse – the banks don’t seem to realise the opportunities they are missing. A number of golfers have already paid their 5 euro annual membership to the society which comes into force on March 1st. A gorgeous sunny day for our 1st major trophy event of the year. 42 players were drawn out in pairs for the 2 ball scramble. It was the 1st time we have tried the 2 ball version of this popular format and it came as a bit of a shock to find out how difficult it was! Even with 2 goes at every shot it was made difficult by the speed of the greens and the tricky pin positions. the ball had to be either below the hole or on the same level otherwise a 2 putt was very unlikely. 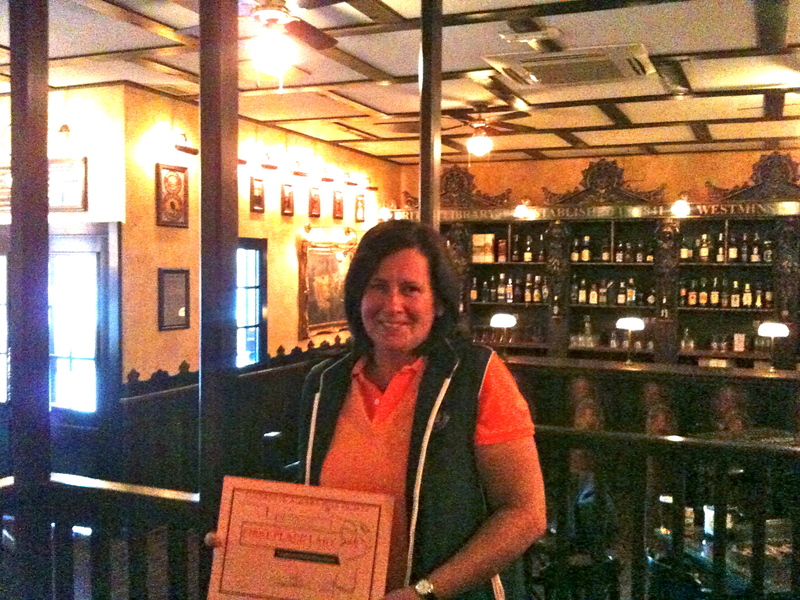 The presentation was made at Scot’tees in El Pareton and we had a fantastic night. Cheap transport was provided in David Inghams’ two 9 seater minbuses. The buffet was superb and there were about 20 other prizes given out in the free draw ranging from a round for 2 inc buggy at any Polaris course to bottles of wine. I’d like to thank the sponsors of these prizes. 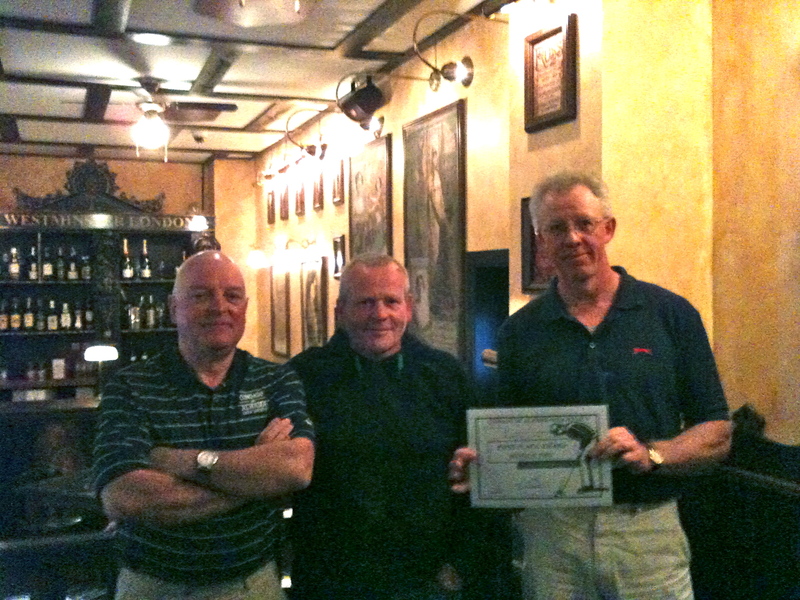 Cath also presented a framed certificate to the founders Dave Lloyd, Graham White and Barry Barker. the DJ provided the music and many of the guests provided the singing. About a dozen showed their hidden talents but I think special mention must be made of Andy Ball’s Elvis impersonation with all the actions! Jim Alwells’ tribute to Frank Sinatra was spot on and Fred Twomey gave us the sound of Ireland complete with leprachaun hat and beard! The room was an ideal size for the 50 or so partygoers and I think Scot’tees were probably grateful to get a weeks takings over the bar in one night! Thanks to Cath and Kev for organising the fabulous night out and to Dave Lloyd for supplying the main prizes. Hopefully Cath will organise more events in the near future. Next week is a 4 person team event with 2 to count on the 1st 6 holes, 3 on the next 6 and all players to count on the last 6. I have put the summer fixture list under the events tab. There will be 2 more major events donated by myself and Graham. At easter it is the Graham White pairs strokeplay cup and on July 15th it will be the Barry Barker individual strokeplay championship. All our individual comps are stableford so it will be a good test when every stroke counts. The weather here is fantastic at the moment and the course is playing really well. No news on the clubhouse though.